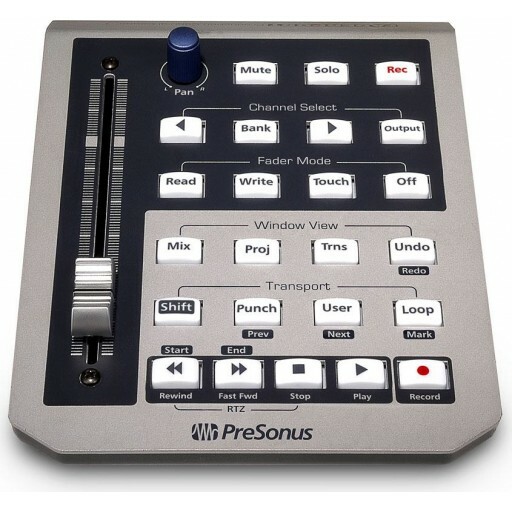 PreSonus offers up the revolutionary FaderPort controller. This desktop USB/MIDI controller for computer recording allows you to write single-channel and group-channel fader automation along with complete transport control. The FaderPort is loaded with a high-quality motorized long-throw fader to give you the feel needed for recording perfect fades and writing automation. A footswitch jack is also included on the FaderPort for hands-free punch in/out during recording. The FaderPort works with any Mac or Windows based recording software including Pro Tools, Cubase, Nuendo, SONAR 6, and Logic.